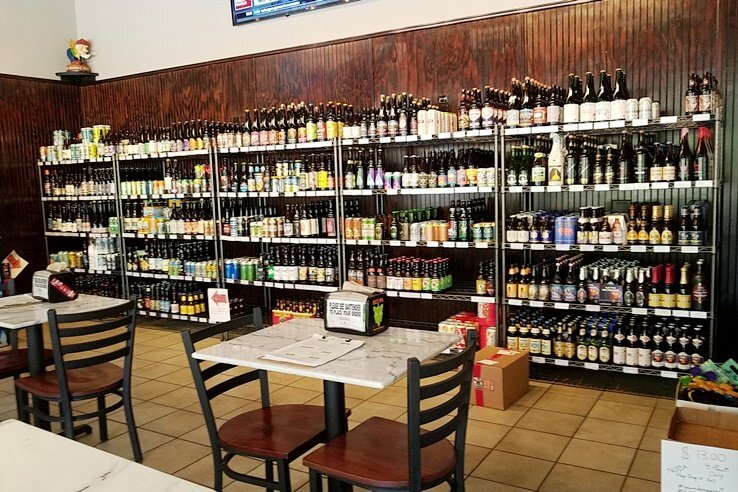 Along with beer and brewery boom here in North Carolina, one other type of storefront has proliferated: the bottle shop! 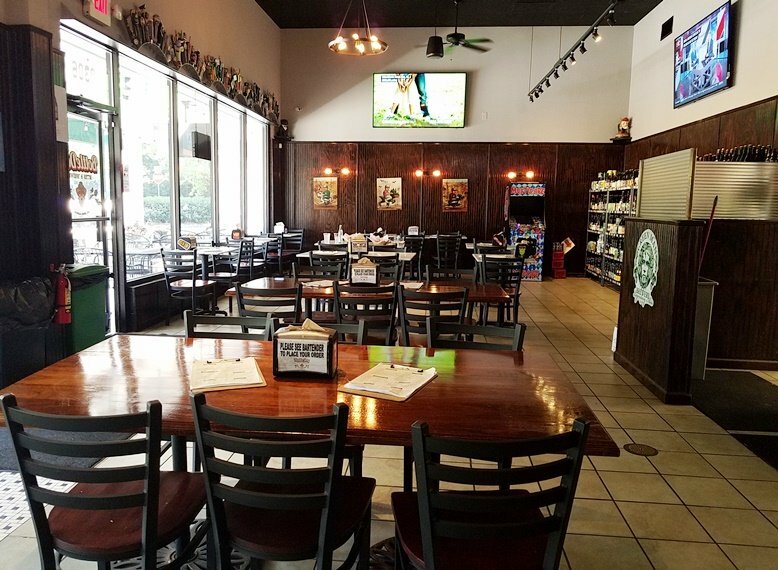 A place where you can sample some craft brews or grab a specialty 4-pack to enjoy at home. And usually they have one thing in common, no food! 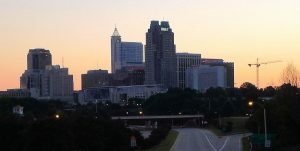 But they usually give you the option of BYOF or ordering food from a nearby restaurant or delivery service. 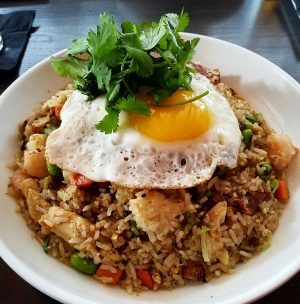 Recently I ran across BottleDog Bites and Brews in Cary online and the reviews mentioned the food quite often. Could it be true? Might there be a bottle shop in the area that’s now offering great food on top of their beers? Well it was time to find out! 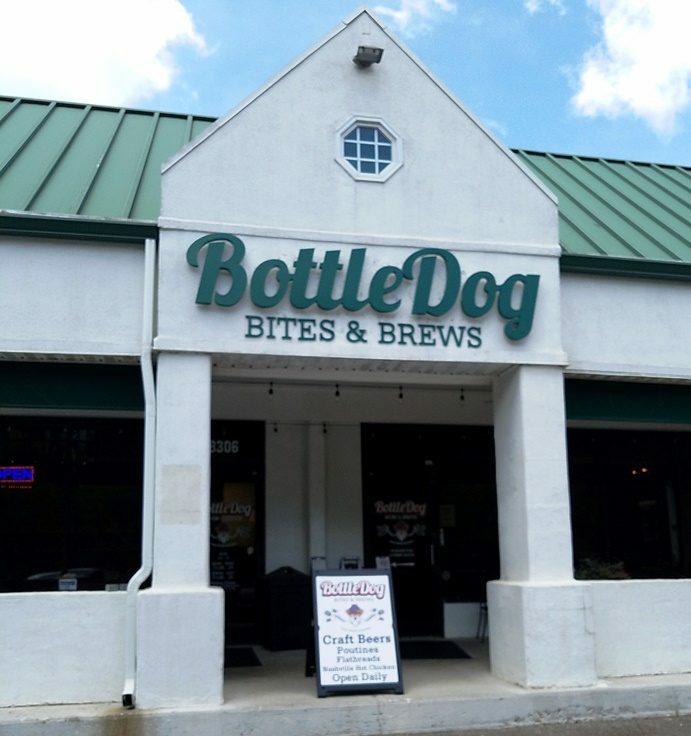 We head on over to the address looking hard for BottleDog Bites & Brews and the GPS is only somewhat helpful getting us to Chapel Hill Road. We find ourselves in a small plaza with Woody’s Sports Tavern and not much else, we start scratching our heads. But we’re not ready to give up and head to the right-hand side of the plaza and find BottleDog’s storefront. 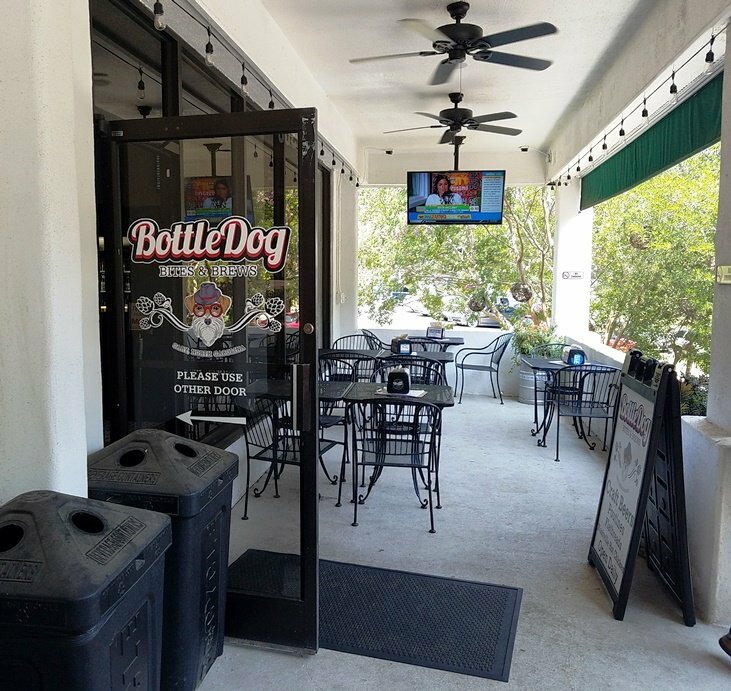 Located in the old Maximillians Pizza Kitchen, there’s a nice covered patio up front that looks dog-friendly! Heading on inside to BottleDog, we find a large beer bar on the right hand side and a retail beer section and dining area to the left. 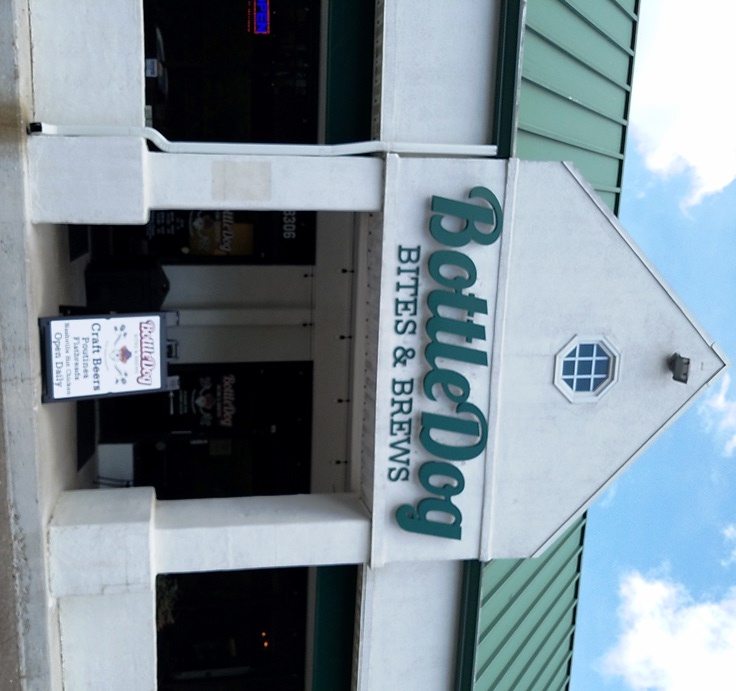 BottleDog is airy and open, there’s plenty of space to stretch out in here, it definitely feels different than most other bottle shops I’ve been to in the Triangle! 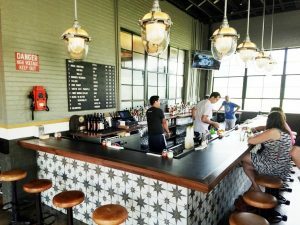 It neatly fills the space between bottle shop and restaurant, similar to State of Beer in Raleigh. But there are some more pleasant surprises to come! At the bar, BottleDog has 10 or 12 beers on tap, I go with the Bond Bros American IPA, Obfuscate! It has a super floral palate but also a nice clean afterbite with just a touch of hops, dee-licious! My beer loving buddy gives BottleDog’s beer selection a big thumbs up on its quality. Peering through the food menu, we find some really cool options for lunch. Poutine?! A beaver tail? Or how about some smoked meats? 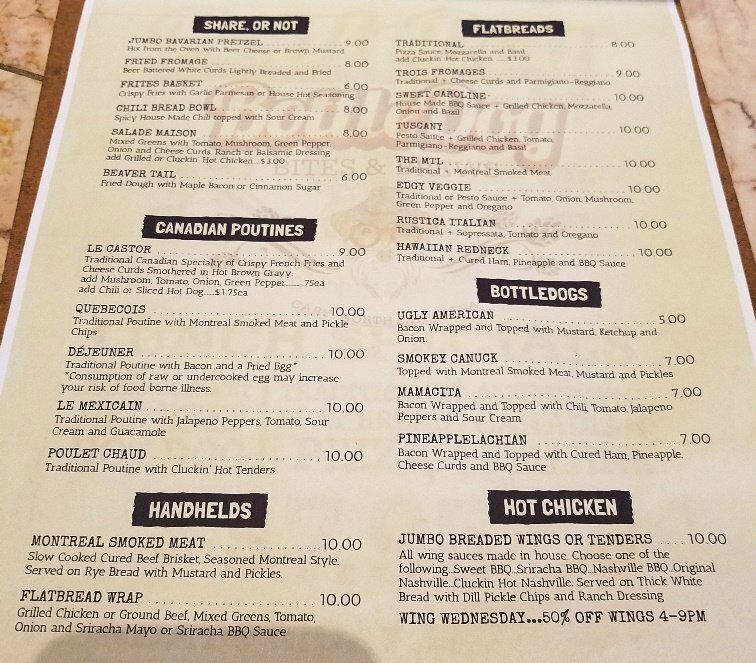 So in addition to the usual hot dogs and flatbreads, BottleDog seems to be going a bit Canadian with the menu which is fine by me, I love Canada! We put our food orders in and just sit back and enjoy our beers. It’s pretty quiet given a holiday weekend but slowly people start trickling in with kids and dogs in tow. 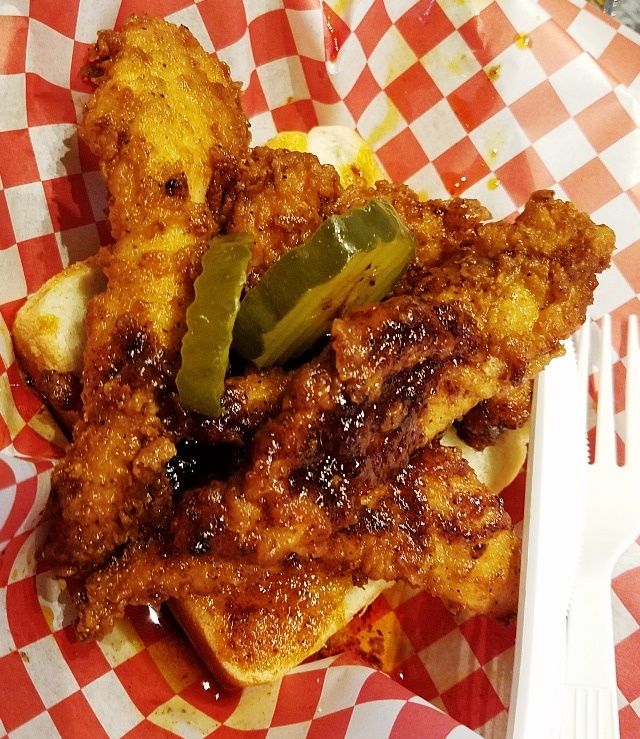 Soon enough, our food starts coming out starting with my friend’s Nashville hot chicken tenders. 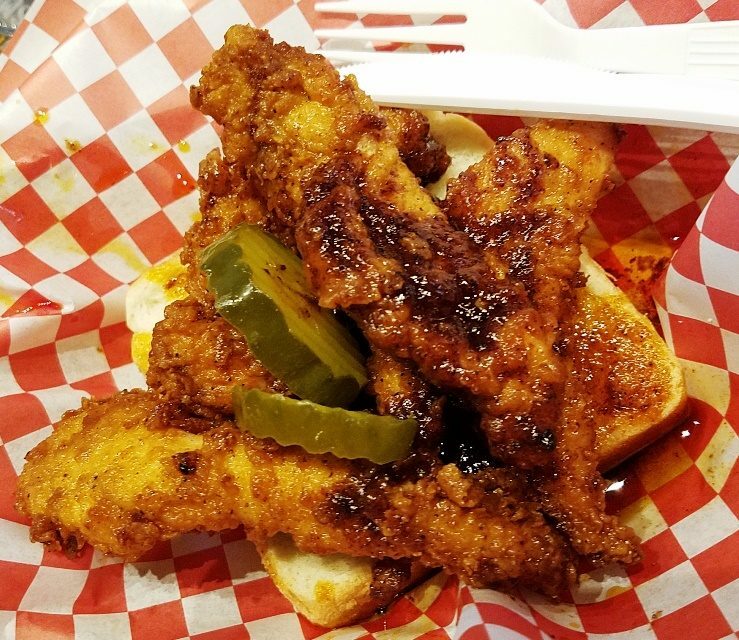 Served up on some white bread and thick pickles, it looks fantastic and spicy! I hold back on a taste since I need to save room for my meal. 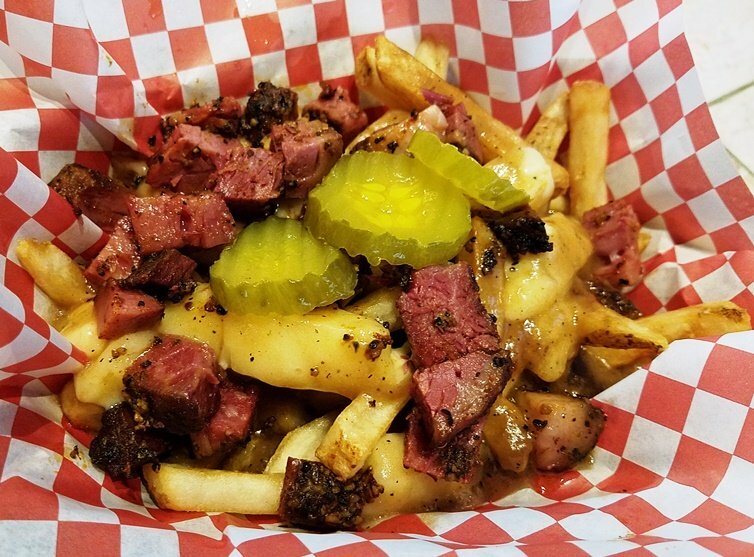 My Quebecois poutine comes out next and it starts with their basic poutine (fries, brown gravy and cheese curds) but adds in some smoked meat and pickles, yum-may! I haven’t eaten much poutine in my life but this dish is G-O-O-D! The warm potato is soaked in the gravy and the cheese is just decadence on top. Add in the peppery smoked meats and you’ve got yourself a mouthful! I’m already looking forward to trying some of the other poutines, stat. 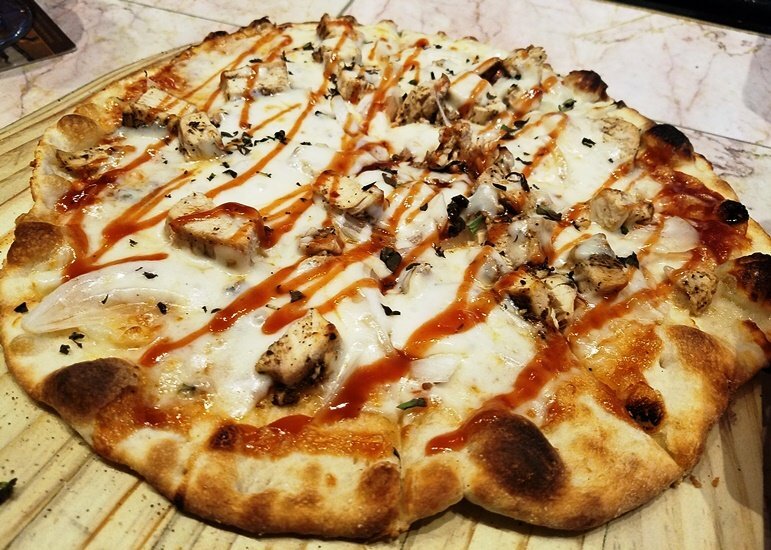 The Sweet Caroline flatbread also hits the spot with a perfectly done thin-crust topped with mozzarella, onions and grilled chicken. House-made barbeques sauce is drizzled on top making for a delicious barbeque chicken pizza (I know, they call it flatbread here, but…) While the crust at BottleDog isn’t a perfect Neapolitan style, it’s similar but with a crisper bottom to hold all the toppings. An excellent pie and plenty to eat for one person, you can certainly share for two lighter appetites.